Febuary 2019 - Dr. Jackson hosted his 4th annual blood drive and teamed up with the fantastic people at LifeSource Blood Services and Culver's! 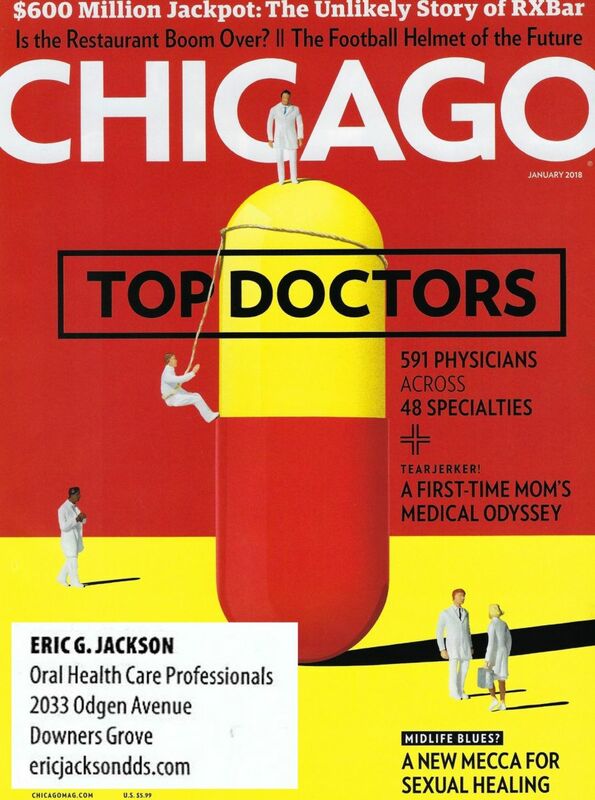 January 2019 - Dr. Jackson is 1 of 169 general dentists to be listed in the January 2019 "Top Doctors" edition of Chicago Magazine. His 2nd year receiving this honor! Click HERE to see the cover of the magazine. December 2018 - Dr. Jackson's article "Maintain Balance in Your Practice During the Hectic Holidays" is published by the Academy of General Dentsitry on their national blog "The Daily Grind". Click HERE to link to the website or HERE for a downloadable PDF. December 2018 - The office again ran a very successful Marine Corps Reserve Toys-For-Tots drive. Thank you to all who donated! November 2018 - Our office ran our 1st annual bood reive for Bernie's Book Bank and it was a great success! Did you know that 2 out of 3 low-income children have no books of their own? Bernie's Book Bank, CHicago's largest provider of Qquality children's books, is changing that by providing children 12 books per year for 12 years! And it's all thanks to donated books from kindhearted people like you! November 2018 - Dr. Jackson's article "Harvest your Dental Practice" is published by the Academy of General Dentsitry on their national blog "The Daily Grind". Click HERE to link to the website or HERE for a downloadable PDF. October 2018 - Our office held our 2nd annual Operation Gratitude "Halloween Candy Give-Back Program"! We collected hundreds of pounds of candy that was distributed to all the wonderful men and women of the U.S. Armed Forces via the amazing people of Operation Gratitude. September 2018 - Dr. Jackson's article "Be an Influencer" is published by the Academy of General Dentsitry on their national blog "The Daily Grind". Click HERE to link to the website or HERE for a downloadable PDF. August 2018 - Our patient Kristy won our office's "Show us your Back-to-School Smile" contest and a prize of $200 Target gift card! August 2018 - Dr. Jackson sponsors the annual Downers Grove Park District Fishing Derby and everyone has a WHALE of a good time! July 2018 - Dr. Jackson's article "A Well-Informed Patient is a Must for the Modern Dental Practice" is published by the Academy of General Dentsitry on their national blog "The Daily Grind". Click HERE to link to the website or HERE for a downloadable PDF. July 2018 - Our staff outing to the Chicago White Sox Dental Night was a great teambuilding event and an overall fun time! July 2018 - Dr. Jackson attended the Illinois Dental Society's Mission of Mercy event in Springfield Illinois. This year's event totaled over $1 Million dollars in donated dentistry! July 2018 - Our Dr. Jackson and office manager Tammie worked helped create and host the very first "Little YOUth Dental Health Day" on July 18, 2018. Our team received a grant from the Chicago Dental Socciety and the William Wrigley Junior Company Foundation to create and hose a free public event to improve the oral health of young pediatric patients ages 0-3 years old in an underserved community. Nearly $5000 of dentistry was provided free of charge at the event, and a great time was had by all. May 2018 - Dr. Jackson's article "Keep Your Practice Fresh and Vibrant With an Annual Spring Cleaning" is published by the Academy of General Dentsitry on their national blog "The Daily Grind". Click HERE to link to the website or HERE for a downloadable PDF. April 2018 - Dr. Jackson and our dental assistant Jennifer attended the 2018 Downers Grove North Wellness Fair. For over 7.5 hours they spoke to more than 2000 students about all things dental. 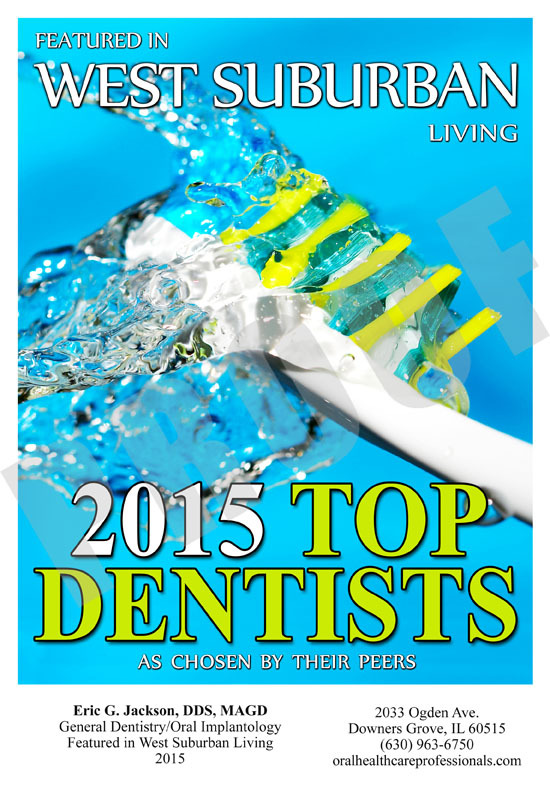 Topics ranged from careers in dentistry, to wisdom teeth, to orthodontics, to oral hygiene, and many more! April 2018 - Chicago Bandits legendary third baseman Amber Patton @amber-patton12 chronicled her Invisalign treatment with our Dr. Jackson via three video diary entires. Click HERE to link to the video diary entries on our YouTube page. March 2018 - Dr. Jackson was invited by the Health Department of Proviso West High School to spend the entire day speaking to their health classes. He gave 6 one-hour lectures entitles "The Essentials to Good Oral Hygiene and Dental Care." The lecture covered topics ranging from why it's importnat to visit the dentist regularly, to proper oral hygeine techniques, & oral cancer and oral STDs. February 2018 - Dr. Jackson helped instruct a class on the finer points of Sports Mouthguard Fabrication at teh 153rd Annual Chicago Dental Society's Midwinter Meeting. February 2018 - Dr Jackson and his friends from the DuPage County Health Department once again teamed up and provided free pediatric dental exams for the American Dental Association's national "Give Kids a Smile" day! February 2018 - Dr. Jackson's article "Use Dental Meetings to Combat the "February Patient Slowdown" is published by the Academy of General Dentsitry on their national blog "The Daily Grind". Click HERE to link to the website or HERE for a downloadable PDF. January 2018 - Dr. Jackson's article "Your Child's First Visit: WHen to Take your Child to the Dentist" was published by Kidlist:Activities for Kids website! Click HERE to link to the website or HERE for a downloadable PDF. January 2018 - Dr. Jackson hosted his 3rd annual blood drive and teamed up with the fantastic people at LifeSource Blood Services and Culver's! January 2018 - Dr. Jackson's article "Make a 2018 Resolution for Both Yourself and Your Practice" is published by the Academy of General Dentsitry on their national blog "The Daily Grind". Click HERE to link to the website or HERE for a downloadable PDF. 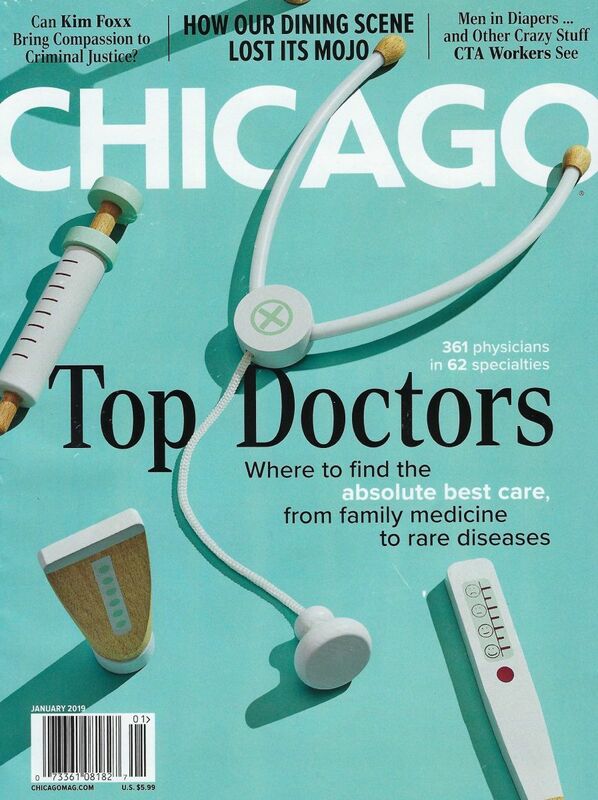 January 2018 - Dr. Jackson is 1 of 47 general dentists to be listed in the January 2018 "Top Doctors" edition of Chicago Magazine. Click HERE to see the cover of the magazine. December 2017 - Dr. Jackson is interviewed by Mr. Michael Arias of The Dental Marketer. Click HERE to link to episode #88 "If You Have A Comprehensive Modern Dental Practice, Listen to This Now! With Dr. Eric Jackson." The interview is also available on iTunes, Google Play, and Stitcher. December 2017 - Dr. Jackson's article "Patient Communication Ideas for the Modern Era" published by the Academy of General Dentistry on their blog The Daily Grind. Click HERE to link to the website or HERE for a downloadable .pdf. November 2017 - Dr. Jackson is featured in the "Sound Off" section of The Academy of General Dentistry's (AGD) national magazine "AGD Impact." He was asked by the AGD to respond to the question "What do you value most about your AGD membership?" Click HERE for a downloadable PDF of the page and HERE to visit the AGD Impact website. November 2017 - Dr. Jackson guest lectures for the Department of Kinesiology at North Central College. Topic: "An Overview of Modern Sports Dentistry". View photos HERE. September 2017 - Dr. Jackson's article "It’s Not ‘Just a Cleaning'..." published by the Academy of General Dentistry on their blog The Daily Grind. Click HERE to link to the website or HERE for a downloadable .pdf. July 2017 - Dr. Jackson's article "Creating a Knowledgeable Team" published by the Academy of General Dentistry on their blog The Daily Grind. Click HERE to link to the website or HERE for a downloadable .pdf. May 2017 - Dr. Jackson's article "Cross-Train for Dental Success" published by the Academy of General Dentistry on their blog The Daily Grind. Click HERE to link to the website or HERE for a downloadable .pdf. March 2017 - Dr. Jackson's article "Turn a ‘Triple Play’ for Your Patients" published by the Academy of General Dentistry on their blog The Daily Grind. Click HERE to link to the website or HERE for a downloadable .pdf. October 5, 2015 - I was thrilled to be featured in an hour long interview by famed American dental innovator/guru Dr. Howard Farran for his “Howard Speaks!” podcast. The hour long interview entitled Episode 176 “Why Be Multidisciplined? with Eric Jackson, DDS: Dentistry Uncensored with Howard Farran” was distributed and seen in over 206 countries in multiple online locations including DentalTown.com, YouTube, and iTunes. As you might imagine, the conversation was wide ranging. September 2012: Dr. Jackson's Downers Grove Patch newspaper article titled "Ask a Dentist: Get the Most Out of Your Dental Benefits" Click HERE. 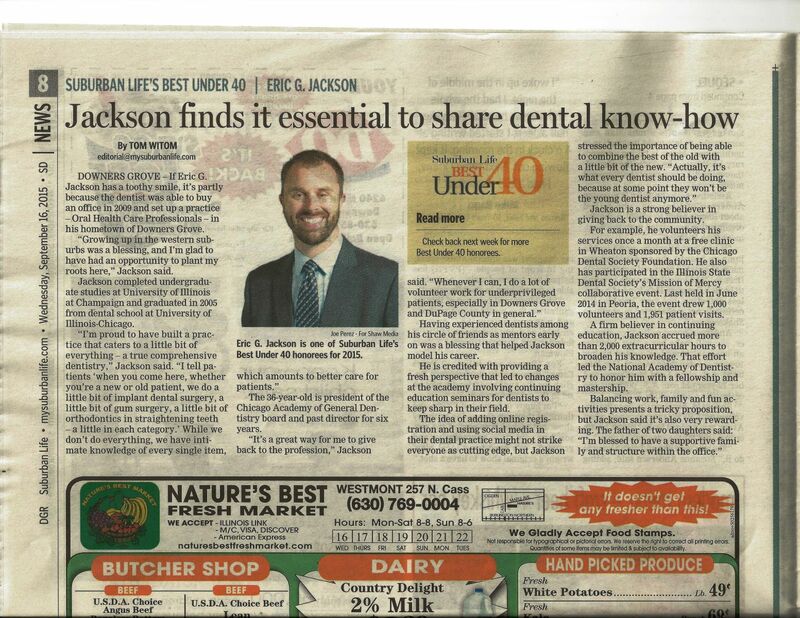 June 2012: Dr. Jackson's Downers Grove Patch newspaper article titled "Ask a Dentist: Dental Technology/Advancements part 3 of 3." Click HERE. May 2012: Dr. Jackson's Downers Grove Patch newspaper article titled "Ask a Dentist: Dental Technology/Advancements part 2." Click HERE. April 2012: Dr. Jackson's Downers Grove Patch newspaper article titled "Ask a Dentist: Dental Technology/Advancements." Click HERE. March 2012: Dr. Jackson's Downers Grove Patch newspaper article titled "Ask a Dentist: My Mouth is Always So Dry...What Can I Do?" Click HERE. February 2012: Photos from Dr. Jackson's lecture to the Christ Church of Oak Brook MOPS group titled "Adult and Pediatric Obstructive Sleep Apnea." Click HERE to view the photos on the OHCP Facebook page. February 2012: FM 101.1 Interview with Dr. Jackson #1. Click the green play button. February 2012: FM 101.1 Interview with Dr. Jackson #2. February 2012: FM 101.1 Interview with Dr. Jackson #3. 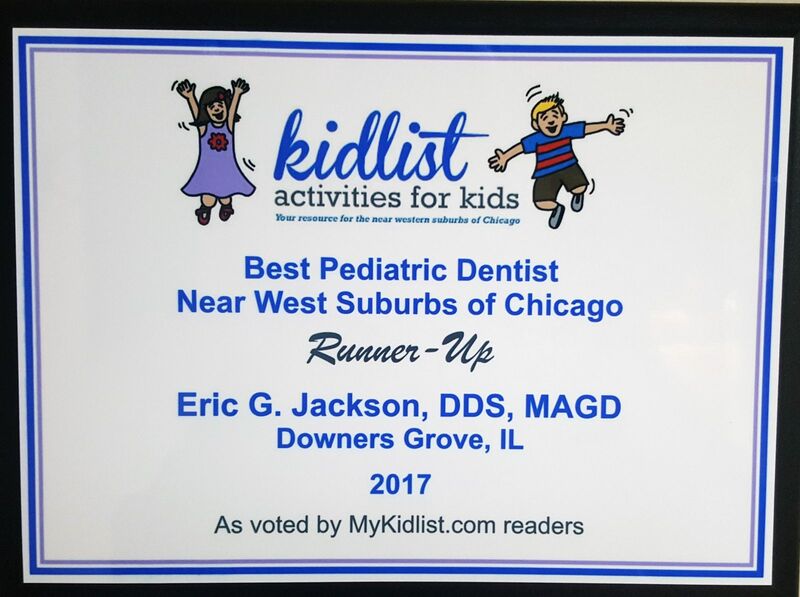 February 2012: Dr. Jackson's Downers Grove Patch newspaper article titled "Ask a Dentist: I'm Concerned About My Child's Thumbsucking." Click HERE. January 2012: Dr. Jackson's Downers Grove Patch newspaper article titled "Ask a Dentist: Child Snores and Grinds teeth. Click HERE.